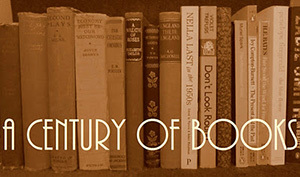 A.A. Milne is proving incredibly useful for my Century of Books: Belinda, an oh so silly and far from brilliant but still fun comedy, allowed me to check off 1918 from my list. Of the 22 years I’ve completed (meaning actually posted reviews for), 6 of them have been done with books and plays written by Milne. How convenient to have discovered my love for him just as I was beginning this project! It is the end of April and Belinda Tremayne, a middle-aged beauty, is down at her country home in Devon. A light-hearted and skilful flirt of the very best sort, Belinda has two local gentlemen vying for her affections: Harold Baxter, a middle-aged statistician, and Claude Devenish, a twenty-two year old poet. They are not quite up to the usual standard of Belinda’s admirers but she is in the country and it is only April. She must make do with what is available. I would like to pause to appreciate Milne’s gift for bestowing the most perfect names on his characters. What could be more perfect for an impish beauty of a certain age than Belinda? Or Harold Baxter for a deeply unexceptional and entirely dull man? And Claude Devenish is the perfect name for a poetic young man fond of floppy hair and awful verse. BELINDA. […] he was quite certain he knew how to manage women, and I was quite certain I knew how to manage men. If one of us had been certain, it would have been all right. After they have both proposed to Belinda, she sets for them what should be an impossible task: to find Miss Robinson’s father. His name, she tells them, is unknown and he can only be known by a mole just here on his arm. Once he is found, she says, she may consider their proposals. But a gentleman with a mark just here on his arm has just arrived in the neighbourhood, bizarrely enough, and begins paying suit to Belinda under the pseudonym of Robinson. He knows her in an instant but eighteen years is a long time and Belinda, Mr Robinson having very properly left his arms and any marking they might have covered when in her presence, does not recognize him. DELIA. What lovely flowers! Are they for my aunt? DELIA. I don’t think we have anybody here like that. Belinda is delighted with this transference of affections, being very fond of Devenish but not at all romantically inclined towards him. With him removed, there is only one lover more to get rid of before she’s left with the only one she wants: her husband. I must say, the unravelling of identities at the end is treated remarkably calmly and presents the weakest scene in the whole play. It would have been much stronger if Jack Tremayne had expressed some amount of amazement or anger at being presented with an 18-year old daughter he knew nothing about. DEVENISH. I don’t quite see your objection to poetry. DEVENISH. Then you are thinking of marrying me. I do wonder how familiar Angela Thirkell was with this play, since this Delia seems to have much in common with Thirkell’s Delia Brandon, daughter of the widely-adored Lavinia Brandon (see The Brandons). This is a fun little play, but by no means a brilliant one. It nothing else, it is amusing for the opening scene of Belinda attempting to gracefully manoeuvre herself into a hammock, knowing what a lovely image she will present when found reclined in it. Of course, it does not quite work so well as planned but Belinda is more than capable of a little improvisation. I unfortunately read this as an e-book and the edition available via Project Gutenberg was an acting version, with lots of distracting blocking notes but none of Milne’s narrative flourishes. They were deeply missed. Hurrah for AAM! 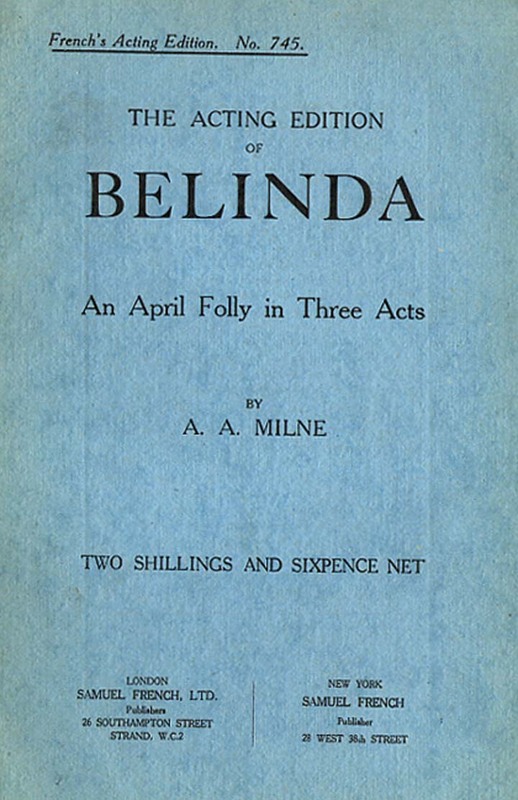 I remember the character of Belinda better than I remember the play – it must be so difficult to create a character so lovable without being irritating, but Milne does it time and time again. Guess what arrived only a few hours after I posted this review? Thank you so much for the copy of Four Plays, Simon. I am very excited to get to read both The Dover Road and Mr Pim Passes By, especially knowing how highly you think of them both. I can only agree with Barrie that Belinda is a minx. A charmingly, entirely adorable minx and one that cannot easily be forgotten, but definitely and unrepentantly a minx. I adore her and would give anything to actually meet someone like her in real life.